On 30th December 2015, Israeli forces showered the Abu Sneineh neighbourhood in occupied al-Khalil (Hebron) in tear gas and shot skunk water at family homes and a kindergarten. When students at the schools in the Abu Sneineh neighbourhood were leaving school after finishing their exams, Israeli forces started throwing stun grenades from the checkpoint the students must cross on their way home from school. They advanced towards the schools firing several rounds of tear gas at the students. 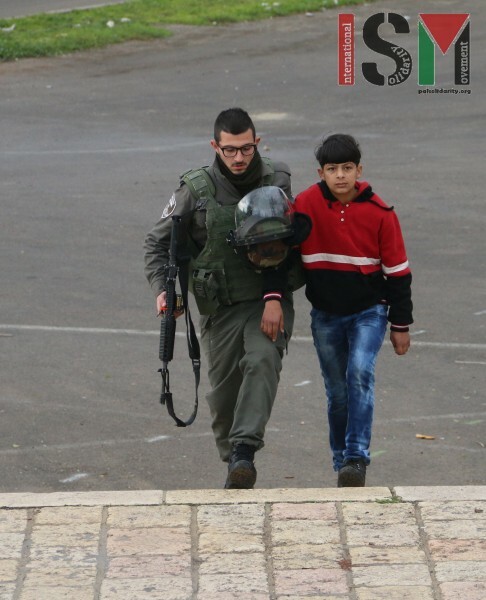 One school boy was randomly grabbed off the street by the border police and taken first to the checkpoint and then to the police station. The 13-year old student is accused of throwing stones. Whether he was released or not is unknown at this moment. Israeli forces then fired endless rounds of tear gas towards the group of students still in the street as well as directly into the neighbourhood. Schoolchildren were suffocating on the tear gas, running away trying to hide from the clouds of gas making their eyes and throats burn and making it almost impossible to breathe. Once the streets were empty, Israeli forces drove the ‘skunk’ truck into the neighbourhood, spraying the foul-smelling liquid aimed from large trucks all over the streets. At the time they sprayed the skunk water, the neighbourhood was already deserted, as clouds of tear gas were still lingering in the streets. Right after, the skunk truck directly targeted a kindergarten and several windows of family homes. This is clearly a collective punishment on the whole neighbourhood, as the foul-smelling skunk water – intended for ‘riot control’ purposes – was arbitrarily used on residents living in the area. Incidents like this, in the Abu Sneineh neighbourhood, are not a rare occurrence, with Israeli forces often firing tear gas directly at or even into family homes and soaking the streets in skunk water. Watch a video of the skunk truck targeting residents of the Abu Sneineh neighbourhood.